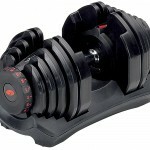 Specs The dimensions for the dumbbell are 6.5″ x 6.5″ x 14.5″ at the 75lb size. The dumbbell can be adjusted from 5-75 lbs with four locking screws, 24 each, 5 lb plates and 4 each, 2.5 lb plates and dumbbell stand. Handles weigh 5 lbs empty and each locking screw weighs 2.5 lbs so the starting weight is 10 lbs. Features Heavy Duty, if you drop them, no need to worry about breaking them since there are no plastic or fragile parts. They’re made for serious lifters. There is also an add-on kit available to go up to 120 lbs each dumbbell. The Good You can quickly adjust each dumbbell from 5-75 lbs with the quick lock design in less than 15 seconds according to the manufacturer. The set comes with a free stand. Simply turn the dial till it clicks and select your weight. Because of the locking screws, there is no rattling or vibration, which can be pretty annoying. Reviews are very positive with an average of about 4.6 stars out of 5 on amazon . Customers are mostly happy with this dumbbell set. The not so good Well, what have people been complaining about? It does take a little longer to change the weight compared to other quick adjust dumbbell sets. This can be troublesome if doing a crossfit type workout that requires quick switching of weights. The weights are actually closer to 70 lbs than 75 lbs, so you’re getting a little less than what was advertised. There is a dedicated storage space (stand), that is about 26.5″ tall x 19″ wide x 14″, which is not necessarily a bad thing, depending on where you’re storing it. Final thoughts The Ironmaster 75 lb Quick-Lock Adjustable Dumbbell System is a great product with excellent reviews. The negative reviews are mostly centered around the time it takes to change the plates and the price. If you need to do circuit training or crossfit, where changing weight quickly is a must, it might be a problem. For, those who just want to lift for without a need to rush exercises, it should be fine. They might be on the expensive side, but they are made to last, and won’t break easily if you drop them on the floor. Plus you can’t beat a lifetime guarantee on parts and repairs. For a great deal, check them out here . 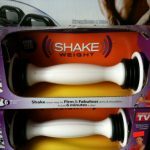 Does The Shake Weight Really Work ? thats awesome that they give you a lifetime money back guarantee! I’m wondering, you mentioned that if you drop them, there’s no need to worry about breaking them. But since they are so heavy duty, is there a danger of dropping them and breaking your floor? I mean, I am not going to be using them in a gym or anything. Sorry, it may be a silly question, but I gotta ask! Depends on what your floor is made of. Could damage tile or wood. If you buy a thick gym mat and workout on that, it should be fine. I have been looking for something I could do in the comfort of my own home since I decided to cancel my gym membership a couple of weeks ago. I am a little worried about find a space for it to fit, but I think I may be able to make it work. No problem. You can also try the bowflex. I like the look of this set. It does seem a little pricey and since I live in South Africa shipping costs will cost a pretty penny. 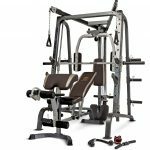 Besides the price factor I think that it is a great option for a home gym. Home gym equipment often looks flimsy and not very sturdy. This set looks like it can withstand wear and tear. Nice site by way . This looks like a really nice set. I have used the bowflex slelct tech dumbbells for years with good success. They are pretty tough, fast to change, and not terribly expensive. That being said, I still think they could be improved. They get stuck sometimes when you are changing the weight, and the rattling is a little rickety. Once these wear out I may have to spring for a better set like these. 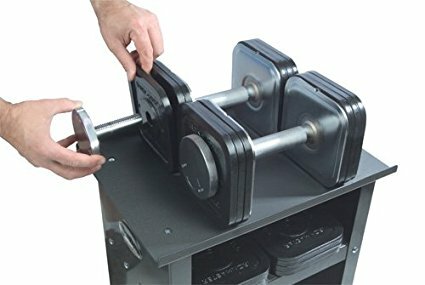 As far as high end adjustable dumbbells go, do these guys have any competitors? You can try Stairmaster Adjustable Dumbbell, it should do the trick. This seems to be a pretty good dumbbell set but the price is fairly steep. 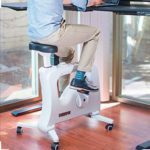 That cheaper Bowflex set might be a better choice for me. You mentioned that people say it takes longer to change the weights than advertised. Does that mean you haven’t actually tried them yourself? I realize a person can’t try every product out there, I’m just asking. Do you have a rating on all the choices of dumbbell sets? You know like best to worst? I haven’t tried it myself, which I stated in the opening paragraph. I’m pretty upfront about stuff like that. I’ve only reviewed 2 so far.